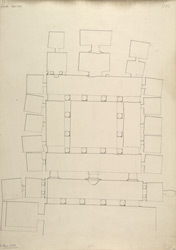 Plan of the Buddhist Vihara, Cave XXIII at Ajanta, from James Burgess' 'Original Drawings from the Buddhist Rock Temples at Ajanta.' The Buddhist cave temples of Ajanta were excavated into a horse-shoe shaped cliff overlooking the Waghora River in the 2nd ? 1st Century BC. Cave XXIII belongs to a later phase, from the end of the 5th century. The cave is incomplete but the columns of the verandah are richly ornamented. The columns are carved with foliated and jewelled bands; the capital has the shape of a compressed ribbed amalaka fruit with small figures of ghanas supporting the bracket above.